Now, I’ve known about the Colorado Rare Bird Alert for a long time, began visiting the web page months ago. In the spring I subscribed to the email updates, glancing at them now and then but never really having the urge to go. You have to be excited, you know? But Sunday morning’s alert caught my eye: a scissor-tailed flycatcher only forty-five minutes away, in the Van Bibber Open Space in Arvada. I’ve always wanted to see this bird—light breast with peachy-to-salmon sides, and a tail that can be twice as long as the bird. A tail that opens wide in a scissors when the bird flies, then folds neatly at rest. 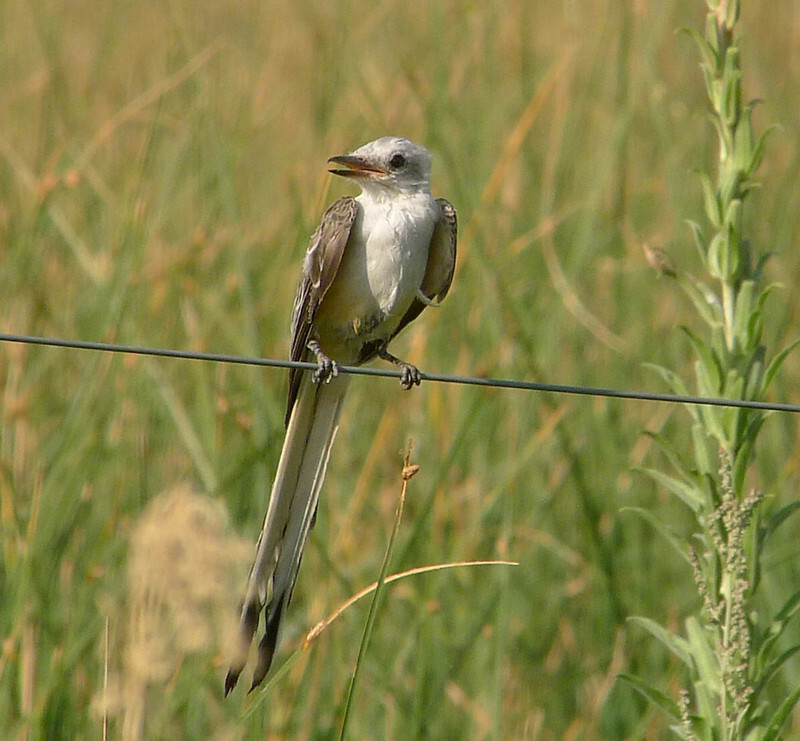 In Colorado, the bird is normally found only in the extreme southeast corner of the state, though in Oklahoma it is so common it is the state bird. A scissor-tailed flycatcher would be a bird to see. I studied up on where the bird hangs out—fences and low perches for sallying out to find bugs—and I listened to its call. I checked the map, then after finding a huge dog park in nearby Westminster (450 acres!) enlisted Tim and Bodhi to come along. We wore Bodhi out in the dog park—a pond! with mud!—then in the Van Bibber Open Space, with a happy filthy dog following quietly on a leash, headed down the trail bordering the north edge of the park, where the flycatcher had been spotted the day before. A few die-hard birders with scopes and binoculars marked the spot. Yes, they said, the bird had been there within the hour. Likely a female; her tail wasn’t quite as long as those of the males. No, she wasn’t visible now; she had flown away to the north. Yes, she would likely be back. But only if we were patient. I settled in to wait. It was sunny and hot. Very hot. How often do you actually see the bird you go out chasing? I had no idea. I’ve rarely traveled out of my way for birds. (The exception is told in the Prologue to my book, available here for download.) And today I was a first-timer with a rare bird. What were my chances of spotting her? The question had barely formed when more birders wandered in. Cheryl set up her scope while Dan focused his camera. Pulling out a bird book, they refreshed themselves on the details: gray-backed bird, darker wings, tail outlined in white. 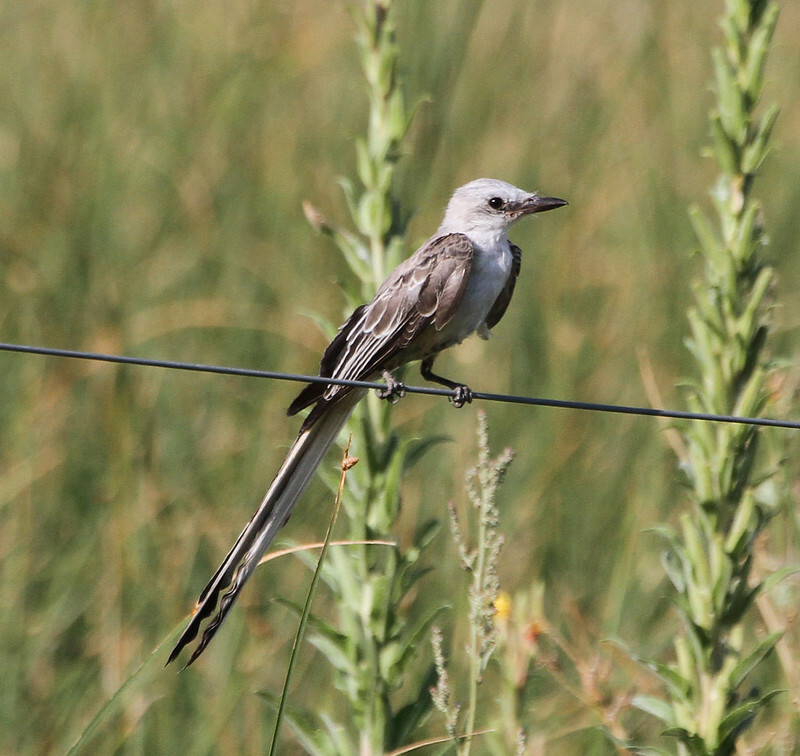 Similar to a western kingbird except for that long tail. Not more than a few minutes later, I heard someone say, “Check the fence!” And there, right in front of us, the bird we had all traveled out of our way to see. White breast, peachy sides (hidden to the camera lens in the strong light), and a tail to die for. She perched on the fence one way, then the other. She sailed off the fence for a snack, hovering in midair with her wings beating fast and her tail scissored wide before diving down into the grasses for a tasty bug. Back on the fence again, she showed off first her front then her back before sallying out again with forked tail for more bugs. We watched and looked, now through binoculars, now through the scope. She had chosen the part of the fence closest to us for headquarters, and she remained there for what seemed like hours though was probably only fifteen minutes or so. We had all the time we needed to absorb every detail of her and to admire her mussed-up, mottled feathers—late summer is molting season for birds. We saw the darker salmon color in the deep creases of her wings when she spread them in flight. When she finally took off for a Russian olive tree in the distance, we packed up our gear, beaming. I had crossed a threshold—chasing a rare bird and, even better, finding her. Note: As of this afternoon, August 30, she was still reported in the same spot. Van Bibber Park is located near the corner of West 58th and Ward. From the parking lot (east end of park), take the northernmost trail. She is hanging out on the fence that traces the north edge of the property.